Whilst we have always been able to produce posters and canvas prints, we now have a printer dedicated to this work, a brand new Hewlett Packard printer capable of very high resolution prints at affordable prices. Stunning colour posters and brilliant canvas prints can now be ordered. Just send us your image by e-mail, disk or USB thumb drive, tell us what size you’d like it (up to A0) and we’ll get back to you with a price and how suitable the image is for your intended purpose. Assuming all is OK, you can pay the deposit and place your order. We’ll advise expected turnaround time when you place the order. 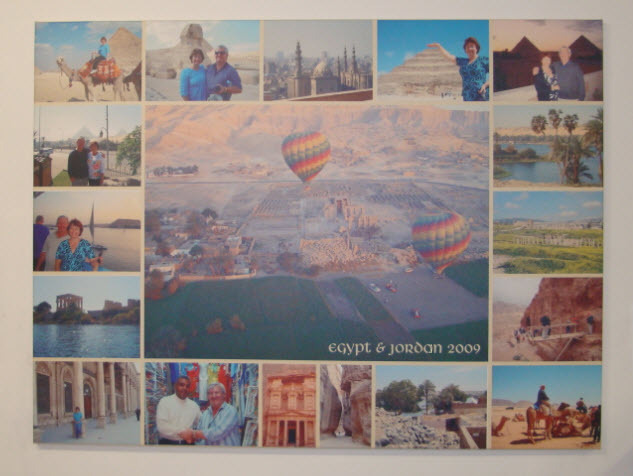 The picture above shows a montage of images from a memorable holiday. Now that holiday will never be forgotten and the photos are a talking point among friends and strangers alike. This is a canvas print stretched around a wooden frame. If you would like something similar, we’ll need photographs numbered in importance and a rough idea of what you’re looking for. If you can’t provide the montage yourself, we can set one up for you but there will be a charge for this service. Feel free to call our office on (08) 9248 6226 and have a chat. Yes, we can send out your unframed prints, no matter where you are in Australia. Framed prints can still be sent but the freight will cost more. Just remember: the better the image, the better the result. As a guide, images “captured” or saved off “the Net” are mostly unsuitable. Digital Camera stills are usually OK to a certain size. A 12 megapixel camera (set to take full size images) will have a higher resolution than a 5 Megapixel camera. When the image has to be printed at a larger size, the file from a 12 Megapixel camera will usually yield a better result. If in doubt, send the biggest file you can lay your hands on. Please also be mindful of copyright.